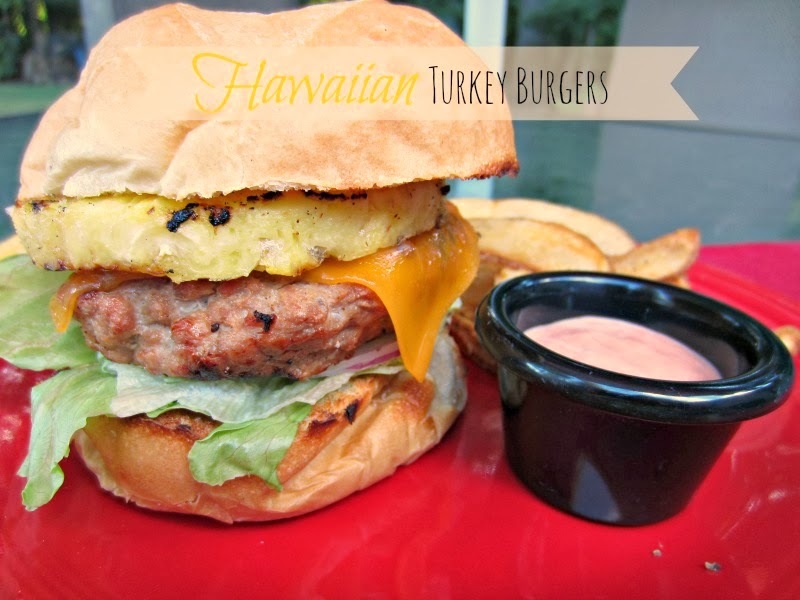 For this week's turkey recipe, I am sharing with you Hawaiian Turkey Burgers made with Butterball® Seasoned Frozen Turkey Burgers. 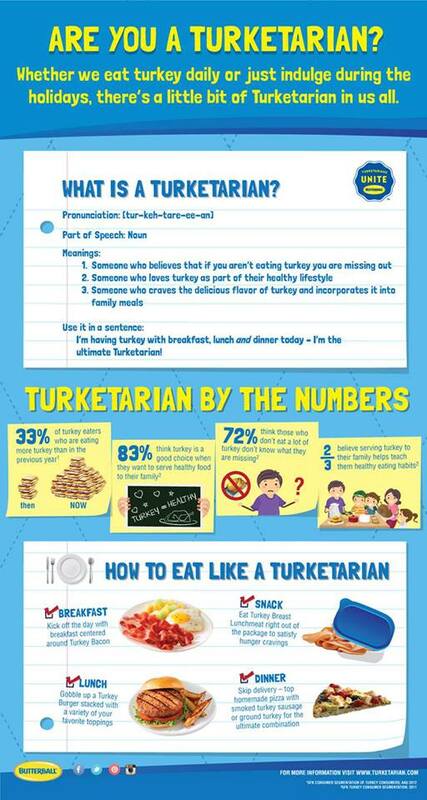 The Butterball® Frozen Turkey Burgers come 6 HUGE burgers to a box and they cook right from the frozen state...no need to thaw before cooking. I really liked that! You can grill, broil, or skillet cook them. I grilled them on my gas grill. They are pre-seasoned and remain quite juicy after cooking. They are on the salty side and a bit high in sodium (680mg per burger) so that was a negative for me. The real "stars" of this turkey burger are the grilled pineapple and the sweet chili mayo though. I mean grilled pineapple? YUM! The sweet chili mayo is simply a one to one ratio of light mayonnaise to chili sauce and it's delicious! I served some baked fries along side and this sauce was not only great on the burger, but it was also great to dip the fries in instead of ketchup. The nutritional stats for his burger are high... but I found the burger was so big and thick, I could only eat about half until I was full. Overall, this is a good recipe to make on a busy weeknight. Although if I made this recipe again, I think I would opt to make my own turkey burger from fresh ground turkey to help cut down on the fat and sodium that are in these pre-made burgers. Since I didn't change a thing in this recipe (except for using light mayo and thin cheddar), I am just going to provide you with a link for the recipe HERE. *Like I mentioned, this burger is HUGE...I was completely satisfied with half a burger with all the fixings which would cut the PP in about half. Don't forget to enter to win some coupons for FREE Weight Watchers® Oatmeal and enter for a chance to win $5000!!! Go HERE for details! And...I'm kinda excited, because I just realized that season 2 of "Homeland" is being released today! Yay! I got sucked into the series after buying my husband season one for Christmas. We don't have any premium cable channels at our house, so we've just been enjoying it on DVD. I'm also a recent fan of "Breaking Bad" (son got me hooked). We power watched the entire first 4 seasons and half of the fifth over the summer to get ready for it to go back on TV. I'm really sad that the series will be ending after a few short episodes....but ya know, as they say..."all bad things must come to a end!" Never fear though, BB will be replaced by the new season of "The Walking Dead" which I sure hope is better than the last season! Are you a fan of any of the series I've mentioned above? Pineapple is amazing. I'm all for adding it to (almost) any recipe! What a delicious meal! I am just starting on Breaking Bad on Netflix - its really good so far! Not a fan of pineapple on burgers sadly, but the turkey looks good! Hi Rene! I will have to pass this recipe onto my mom as she would love it. OH yes I am addicted to the same series! Our son got us started watching BB. It allows us to forget about everything for a while! The thick slice of grilled pineapple is just the perfect touch! Ah! We just received the first disc of Season 2 of Homeland from Netflix today! I am so very excited about watching it!! My husband is also anxiously awaiting the next season of Walking Dead on Netflix. He loves it. The burger looks very yummy..we also love turkey burgers around here :) Thank you so much for linking up at Share Your Stuff Tuesdays..have a great weekend!